There are many who visit Lichgate and catch a glimpse of something otherworldly. Over the years I have heard these glimpsed moments attributed to a myriad of things from the mundane to the profound. But of all the words used to describe these glimpses, the one uttered most often is the word "fairy". Do we know if Laura believed in fairies? At this time no, we can't say with certainity much about a lot of her beliefs. Many of her writings and diaries were destroyed at the end of her life when the cottage she loved stood abandoned. In her books she speaks of fairytales and her favorite playwright, Shakespeare, obviously knew of the Fae. I have personally interviewed a woman who visited Laura and says she is certain Laura believed in them. When Laura visited a very sick child who was her neighbor, she sat at the bedside and told stories of fairies and men. Laura also included this sentence in her last book written about Lichgate, "...I was ready to begin peopling my place withe spirits of Merrie England." (Chapter IV, last paragraph) and the main character in her Master's Thesis, (an embodiment of Laura), affirms a belief in Pan, fauns and dryads, (spirits inhabiting oak trees). To learn more about the influences on Laura, simply visit the Leitmotifs page on this site. Whether you believe in these etheral beings or not, there is a certain magic present in a child's whispered words of what they see and hear. It is for these words and for those awe-struck moments in a place where their imagination can run free, for these reasons, I believe. 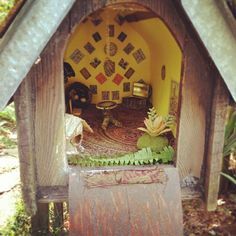 And for those of you who don't believe, go sometime and witness a young boy leaving a red toy car for the faires to drive or see flowers laid before a makeshift fairy house and then take a moment, open your eyes and heart and just look around. Who knows, maybe you will grow to believe in something new, something glimpsed among the leaves. Below is a fairy story written about Lichgate. Read it, enjoy, and feel free to share it with anyone you wish. You may download a copy of the original found in the bottom of a dusty trunk in Laura's bedroom upstairs in the cottage. Written on parchment it had lain for years unnoticed until recently, but now it can at last find its place in the lore surrounding this ever-present, ever-magical place. My name is Laura. I traveled around the world reading old books and meeting interesting people. It was during these travels I began to find a special people, a kind of in-between people who were gradually losing their homes as cities grew and woods disappeared. These in-between people go by many names, they have been called sprites or dryads but you probably know them best as faeries. One day I was walking near the school where I worked deep in thought about these people who were losing their homes and beginning to disappear from our world. During this walk I passed a field and in it saw a magnificent tree with arms spread all around and suddenly I knew that here I could create a new home for all of the in-between people who needed it. I asked a man from the North Mountains to come and help me build this new home. His name was Bascom and he worked with stone and wood creating a place that could weather storms and shelter the magic I knew was gathering. Beneath the limbs of the mighty oak I made a place for the faeries. I built my house nearby to guard the tree and its new guests and now spend my life bringing home the lost in-between people from around world. I planted Holly trees for the holly berry faeries, set stones for gnomes and planted flowers for all the beautiful sprites to play in. I knew we would need a guardian so I brought the largest, toughest bulldog from England to stand guard. His name was Kip and he taught his children the ways of the oak and the treasures it guards. With Kip’s help we created an animal hospital and spent time teaching others all the things we learned from the old books. Time passed and Kip and I grew older and older while the in-between people around my home stayed as young as the day I first meet them. One day, not terribly long ago, Kip and I left on another journey to see if there were any more in-between people that needed a home. While I am gone some of my students and friends promised to care for the oak and tell the story of how all of this came to be. It will be long journey, there are so many places to look for the lost in-between people and I don’t move as fast as I did when I was young. While I am gone these new guardians will be there to introduce you to the little people that hide amongst the leaves. If you have time look for them, you may be lucky enough to hear their laughter in a breeze or see their shy smile behind a tree. But whether you see them or not, know that they are there, know that they welcome you and know that they love the home they share with you.